A game that should have been won comfortably was made to be a lot tougher in the second half than it should have been. Spurs should have been 4-0 up before half-time. 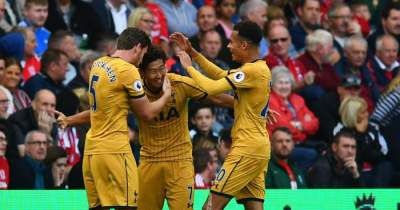 Son once again came up with the goods with two superb goals, one a solo effort an done thanks to some great holdup and lay off play by Janssen. We should have had a penalty fir a blatant push in the back on Dele Alli but the referee, a relative newcomer to officiating in the Premier League, this was only his fourth or five game, bottled it. Shortly after great pressing from Eriksen put a chance on a plate for Dele Alli was blazed over the bar. He scores goals but he does miss a few too many that he shouldn't, something to work on for him. Tottenham totally dominated th first half and had control of the second without creating much, it was all pretty passing with no end produce and when they scored from a cross and header, the crowd were behind them, they had more energy and we looked at times as if we were strolling around. We deserved the win, but we really should be killing off games like this, 2-0 is not a scoreline that puts a game to bed. I keep repeating that when we are winning we have to take the chances that then come our way as if the score is 0-0, we have to be more clinical. There are always improvements that can be made. We sit second in the table, have a UEFA Champions League tie in Russia on Tuesday, then the only two unbeaten sides in the Premier League go head to head next weekend. After his performance I wouldn't be surprised if Son is rested in midweek to save him for that game.